Leonardo is known for his dramatic and expressive artwork and is famous for masterpieces such as The Mona Lisa, The Last Supper, and The Annunciation. Leonardo da Vinci trained as a painter during the Renaissance and became a true master of the craft. During the Renaissance, European artists began to study nature more closely with the goal of painting realistic images of the world. These artists learned to create lifelike people and animals, and they became skilled at creating the illusion of depth and distance on flat walls and canvases by using the techniques of linear perspective. Da Vinci’s powers of observation and skill as an illustrator enabled him to notice and recreate the effects he saw in nature, adding a special liveliness to his portraits. 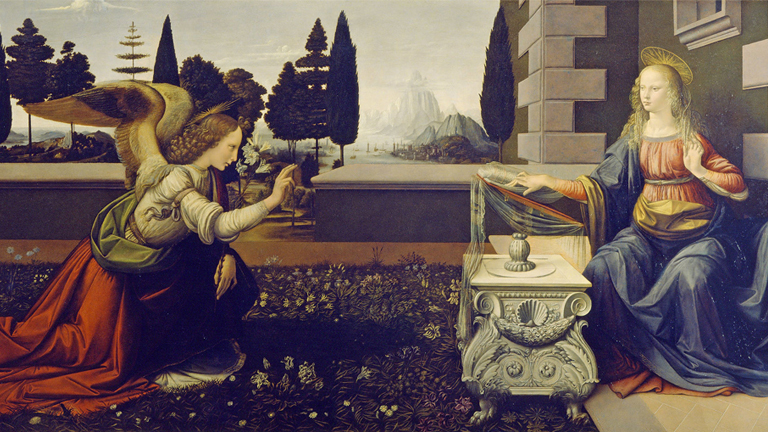 Fueled by curiosity, Leonardo constantly tried to explain what he saw. Because he wrote down and sketched so many of his observations in his notebooks, we know that he was among the very first to take a scientific approach towards understanding how our world works and how we see it. Leonardo recognized that one way to paint scenes realistically was to observe with great care how animals, people, and landscapes really looked. He was also careful to notice the differences in how an object looked when it was close by or farther away, and when it was seen in bright light or in dim light. He wrote detailed notes on his observations and made sketches of the things he saw in his notebooks throughout his life. During the Renaissance in Italy, architects and artists investigated the question of how to draw three dimensional objects on flat surfaces. They began to think of a painting as an "open window" through which the viewer sees the painted world. They also developed a system of mathematical rules, known as linear perspective, to help painters achieve their goal of realism. Leonardo learned the rules of perspective and practiced using the window as a device for drawing perspective correctly while he was an apprentice in Andrea del Verrocchio's studio. Da Vinci created the illustrations for “De Divina Proportione” (On the Divine Proportion), a book about mathematics written by Luca Pacioli around 1498 and first published in 1509. The book was about mathematical proportions, such as the golden ratio it is named for, and their applications to art and architecture. Da Vinci’s use of the golden ratio is evident in some of his own works, even before his collaboration with Pacioli.